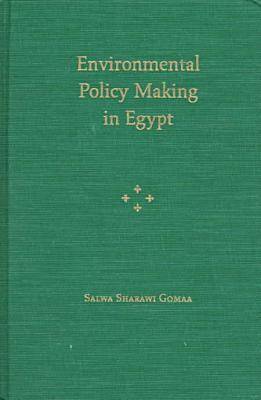 In the first examination of environmental policy and policy making in Egypt, Salwa Sharawi Gomaa analyzes and explains the nature, development, and possible implications of environmental concern as a political issue. She explores the interactions between the Egyptian government, environmental non-government organizations (NGOs), the Green Party, and foreign donors and explains who makes environmental policy, how that policy is arrived at, and what its impact is. Of particular interest is the substantial amount of fieldwork and interviews on which Gomaa's study is based. Her conversations with government officials, NGO environmentalists, and officials from the international donor community provide insight and a concrete application of complex theoretical principles. Through personal contacts at every level of the process, she is able to show how the environment was put on the policy-making agenda, who saw it through the decision-making process, how the international donor community got involved, and how local organizations came to play a role. Unlike the grassroots environmentalism of the West, Egypt's environmental initiative originated with the state, following some prodding from the international community. Gomaa's description and analysis of how this process has advanced in a country rife with political and economic challenges holds lessons for environmental advocates throughout the Third World. Her study will also be of special interest for its examination of the role of NGOs in development and in policy making and the connection between foreign aid and environmental policy. Salwa Sharawi Gomaa is associate research professor in the Social Research Center at the American University in Cairo, associate professor of public and environmental politics at Cairo University, and author of Egyptian Diplomacy in the Seventies (1988).